The lineup reflects the commitment and dedication of many to get ahead of this crisis. Founded in 2012, the Rx Drug Abuse & Heroin Summit is now the largest national gathering of professionals from “federal to family”: local, state and, federal agencies, public health officials, business executives, academia, treatment providers, advocates, law enforcement, and family members working to find solutions that address the prescription drug abuse and misuse epidemic. More than 3,000 attendees participated in 2018. Previous notable speakers have included President Barack Obama in 2016, Congressman Patrick Kennedy and Speaker Newt Gingrich in 2017, and former President Bill Clinton and Counselor to the President Kellyanne Conway in 2018. The meeting is produced by HMP, a leader in healthcare events and education. The 2019 program will deliver practical, evidence-based education and actionable takeaways in 12 key areas, from National Policy Action to Prevention Strategies. 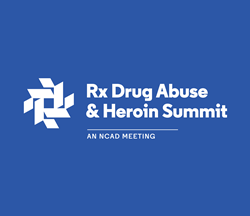 To learn more about the Rx Drug Abuse & Heroin Summit, visit rx-summit.com, and be sure to follow Rx Summit on Facebook and Twitter @RxSummit, using hashtag #RxSummit2019. Media credentials are required to attend any part of the Summit. To obtain media credentials, visit the Rx Summit Newsroom. Contact Kelly McCurdy, Rx Summit Press Officer, at pr@hmpglobal.com or 302.750.6030 for more information. HMP is the force behind Healthcare Made Practical – and is a multichannel leader in health care events and education, with a mission to improve patient care. The company produces accredited medical education events and clinically relevant, evidence-based content for the global health care community across a range of therapeutic areas. Its brands include Consultant360, the year-round, award-winning platform relied upon by primary care providers and other specialists; Psych Congress, the largest independent mental health meeting in the U.S.; EMS World Expo, North America’s largest EMT and paramedic event; and the Symposium on Advanced Wound Care (SAWC), the largest wound care meeting in the world. For more information, visit hmpglobal.com.